Pictured above is the Process Payroll screen. When it is time to process a payroll cycle, this is what you will ultimately use to check that hours, any time off used, deductions, and taxes are being correctly calculated. All of the fields are explained below, and the payroll process itself is also detailed. Pay Frequency - This is the frequency of the payroll cycle you are processing. Employee - The default for this is All Employees; however, you can process a “Special” Payroll for one employee, such as an Advance or a Bonus. Bank Account Paid Out Of - Select a bank account to use for payroll to be paid from. Pay Period Starting Date - This is the start date of the pay period for the selected Pay Frequency. Override Starting Date - Check this box to override the starting date provided. Pay Period Ending Date - This is the end date of the pay period for the selected Pay Frequency. Processed Date - This is the date the payroll cycle was processed. Refresh - If the start or end dates are changed from the default, click the Refresh button to apply your changes. Salary - This is checked if the employee is a salaried employee. If so, nothing will appear in the Hours columns. If the employee is paid according to the hours they work, this box will be unchecked and the hours worked for the time period will appear in the appropriate columns. Straight Hours - This column contains the hours worked in the pay period where the employee earned a straight time rate of pay. Over Time Hours - This column contains the hours worked in the pay period where the employee earned an over time rate of pay. You will need to manually enter any hours that are classified as Overtime. Double Time Hours - This column contains the hours worked in the pay period where the employee earned a double time rate of pay. Shift Diff Hours - This column contains the hours worked in the pay period where the employee earned a shift differential rate of pay. Adj. Hrs - This column can be used to make manual adjustments to employee hours if labor usage cards are not being used. Vacation Time Used - This column displays the amount of Vacation Time used by the employee in the pay period. Sick Time Used - This column displays the amount of Sick Time used by the employee in the pay period. Holiday Time Used - This column displays the amount of Holiday Time paid to the employee in the pay period. Total Time - This column contains the total time for the employee in the pay period. Vacation Time Earned - This column displays the amount of Vacation Time earned by the employee in the pay period. Sick Time Earned - This column displays the amount of Sick Time earned by the employee in the pay period. Straight Wages - This column contains the wages earned for straight time by the employee in the pay period. Over Time Wages - This column contains the wages earned for over time by the employee in the pay period. Double Time Wages - This column contains the wages earned for double time by the employee in the pay period. Shift Diff Wages - This column contains the wages earned for shift differential time by the employee in the pay period. Vacation Wages - This column contains the wages paid for Vacation Time used by the employee in the pay period. Sick Pay Wages - This column contains the wages paid for Sick Time used by the employee in the pay period. Holiday Wages - This column contains the wages paid for Holiday Time used by the employee in the pay period. Base Wages - This column displays the totals of all of the wage columns for the employee in the pay period. OV - If you need to override the base wages, check the box in this column and make your adjustments in the previous column; the field that was adjusted will display a red background. Commission - Enter any commission due to the employee for this pay period in this column. Bonus - If you will be giving a bonus to an employee for this pay period, enter the amount in this column. Car Allowance - If the employee has a car allowance benefit checked to be included on this pay period, the amount will display here. This option can be found in the Employee Setup screen under the Payroll Information tab. OV - If you need to override the Car Allowance payout amount, check the box in this column and make your adjustments in the previous column; the field that was adjusted will display a red background. 401-K - If the employee is making contributions to a 401-K, the amount will display here. This option can be found in the Employee Setup screen under the Payroll Information tab. OV - If you need to override the 401-K amount, check the box in this column and make your adjustments in the previous column; the field that was adjusted will display a red background. Note: The above columns Car Allowance and 401-K are examples of deductions or fringe benefits. Each type of deduction or payout you have setup for your company will also have an override column associated with it. Federal Income Tax - This column displays the amount of Federal Income Tax that will be withheld from this employee for this pay period. OV - If you need to override the Federal Income Tax, check the box in this column and make your adjustments in the previous column; the field that was adjusted will display a red background. FICA - This column displays the amount withheld for FICA from this employee for this pay period. OV - If you need to override the FICA amount, check the box in this column and make your adjustments in the previous column; the field that was adjusted will display a red background. Local Income Tax - This column displays the amount of Local Income Tax that will be withheld from this employee for this pay period. OV - If you need to override the Local Income Tax, check the box in this column and make your adjustments in the previous column; the field that was adjusted will display a red background. Medicare - This column displays the amount of Medicare that will be withheld from this employee for this pay period. OV - If you need to override the Medicare amount, check the box in this column and make your adjustments in the previous column; the field that was adjusted will display a red background. State Income Tax - This column displays the amount of State Income Tax that will be withheld from this employee for this pay period. OV - If you need to override the State Income Tax, check the box in this column and make your adjustments in the previous column; the field that was adjusted will display a red background. Advance Repayment - If the employee has an outstanding balance for an advance that was taken, the repayment amount to be deducted will display here. Advance - If the employee is receiving an advance on this paycheck, the amount is entered here. Net Pay - This column displays the net pay for this employee. Check Number - The default for this column is “TO PRINT”; however, you can specify a particular check number by clicking in the field and typing in the desired number. When it is time to process a payroll cycle, navigate to the Process Payroll screen and select the Pay Frequency of the payroll you would like to process. Depending on how your employees are setup to be paid, it is possible you will be processing multiple payroll cycles during some weeks. The most common pay frequencies are Weekly, Bi-Weekly, Semi-Monthly, Monthly, Quarterly, and Annually. After selecting a Pay Frequency, check the Pay Period Start and End Dates to ensure they cover the correct time period. If you need to make adjustments to the Start and/or End Dates, be sure to click the Refresh button to apply changes. Once you have these options filled in, choose a Bank Account to pay your payroll checks from. After selecting the Pay Frequency, a list of applicable employees should appear. By default, all employees with the Pay Frequency you selected will be listed; however, you can uncheck an employee if they will not be included in the payroll cycle that is being processed. If you have selected the option in Payroll Setup to “Prompt Before Processing Payroll”, the system will ask if you would like to retrieve hours worked from usage cards. If you choose to do so, the employees who are paid hourly will have their time appear in the Process Payroll screen. Any salary employees that are paid on the Pay Frequency selected will not have any hours; their salary for the pay period will appear in the Straight Time column. If you have selected the option to calculate time from usage cards, you will not receive a prompt; the Process Payroll screen will open automatically with the hours from labor usage cards filled into the appropriate columns. If you have selected the option to manually enter time, you will need to do so for each employee who is paid hourly. When the Process Payroll screen opens, click the ellipsis in the Adj Hrs column; the window below will appear. Fill in the necessary fields and click OK; the time entered will appear in the Process Payroll screen. When adjusting time in payroll, if you are using labor usage cards, Control will automatically create adjusting labor usage cards. You can adjust downwards by using negative numbers. If an employee had worked 44 hours in a week, a typical adjustment might be to create an adjustment for +4 hours of overtime and -4 hours of straight time. This would result in no increase in time, but would reallocate the time from straight time to overtime. When adjusting hours, you have the option of assigning the adjustment to a particular order or leaving it unassigned. If you assign it to an order, increases or decreases in wages associated with the change will be assigned to the order. Otherwise, they will be still be recorded in the GL, but not attributed to a specific order. To easily access all overtime records, some businesses prefer to create an ongoing “overtime” order to record all overtime against. If an employee is using Vacation, Sick, or Holiday time for a selected payroll cycle, enter the number of hours they used during the pay period in the appropriate column. The Vacation Wages column (or Sick or Holiday, depending on what kind of time was taken) should fill in with the correct wages for the time taken. Another way to handle this is to have a Time Clock Station setup for each type and associate each station with the appropriate Workers Comp code, then enter the time taken using the corresponding station. For example, if an employee has taken a day of vacation, their time should be entered for that day using the Vacation station, and when the payroll cycle is processed, the time will appear under the Vacation Hours Used column. Salaried employees will have their pay amount appear in the Straight Wages column, but no hours will be filled in for these employees. If an employee is due a commission on a pay cycle, simply enter the amount in the Commission column for the appropriate employee. If an employee will be receiving a bonus on a pay cycle, simply enter the amount in the Bonus column for the appropriate employee. If an employee requests an advance on their pay, you can enter the amount in the Advance column. Note: be sure to set up a repayment amount to be deducted each pay period; this can be found in the Employee Setup screen under the Advance tab. Each deduction that an employee has opted for will appear in the appropriate deduction column; these will vary from company to company and employee to employee. If you need to adjust the amounts of any deductions, check the OV (override) box behind it and make the adjustment directly in the field. The adjusted field will display a red background. Note: If you have employees who are requesting adjustments often, you may want to encourage them to change any applicable withholdings to cut down on this practice. When it is time to process a payroll cycle, go to Payroll>Process Payroll and select the pay frequency and the bank account to process the payroll from. Once you have verified that the time and deductions are correct for all of the employees in the selected payroll cycle, click the Post button on the right toolbar. After processing a payroll in Control, a window similar to the one below will open that shows all the checks that will be printed. On this screen, you can change the first check number, or deselect any checks that you may not want to print at this time. When you are finished making any changes (if necessary), click OK to begin printing the paychecks. Occasionally, a manual paycheck will need to be issued. When this happens, the best way to handle it is by processing a special payroll cycle for the one employee (so that all appropriate taxes and deductions are withheld) and then printing their paycheck. To run a “special” payroll cycle, go to the Process Payroll screen, and select Employee, then choose the employee who you are creating a special payroll for, and process the payroll as you normally would. When the checks have been printed, a window appears asking you to select the paychecks that didn't print correctly. If a check fails to print correctly when processing a payroll cycle, check the box next to it in the window and click Re-Print. If all of the checks printed correctly, click Close. To reprint a payroll check, select View Payroll from the Payroll menu. Select which payroll includes the check that you wish to reprint and select it from the list of payroll cycles that are listed to the left of the screen. After clicking on the payroll cycle, all the checks that were included in that payroll will be shown to the right. Check the box next to the payroll checks that you wish to reprint. After selecting the checks to be printed, click Print and Default Paycheck from the menu on the right side of the screen. If all payroll checks need to be reprinted, simply click Select All and then Print. After clicking on the Print button, you can preview the checks before printing them by clicking Preview. A screen will open showing all the checks that will be printed. Below is a sample screenshot. After posting the payroll and printing the checks, the payroll cycle is considered closed. The end date on the payroll cycle is the last day that is included in the pay period. To void an entire payroll, select View Payroll from the Payroll menu, then select the payroll you want to void. You may then either choose the Void Payroll button on the Action Toolbar on the right, or the Void Payroll button towards the top of the screen. You will likely find it necessary to enter starting balances of things like vacation time earned, and also year to date amounts for hours and earnings. 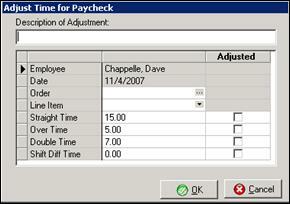 To do this, navigate to the Adjust Payroll option; the screen below will appear. 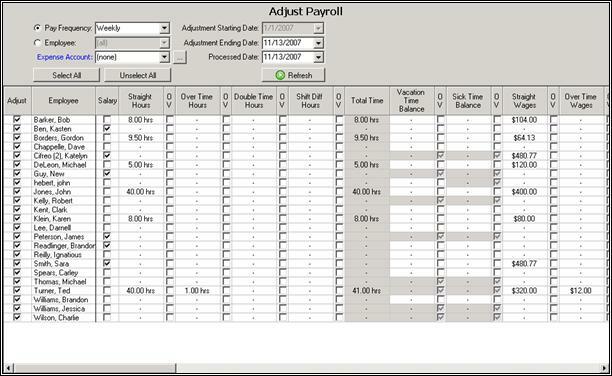 The Adjust Payroll screen is pictured above. When you have payroll adjustments that need to be made, navigate to this screen, select the employee(s) to make adjustments to, and enter their information. Once you have all of the employees' information entered, click Post to save the adjustments. Pay Frequency - Select the Pay Frequency of the employees for whom you will be entering adjustments. Employee - If you will be entering adjustments for only one employee, choose this option and then select the employee. Expense Account - Select the GL account to post the adjustments to. Adjustment Starting Date - This date will default to the first day of the current year. Adjustment Ending Date - This date will default to the current date. If you change this date be sure to click the Refresh button. Processed Date - This date will default to the current date. If you change this date be sure to click the Refresh button. Select All/Unselect All - The Select All button can be used to quickly and easily select all employees if you will be making adjustments to every employee. If you only need to make adjustments for one (or just a few) employees, the Unselect All button will uncheck all employees so that you can manually check the employees whom you will be making adjustments to. Refresh - This button is used if you have made any changes to the dates above. Adjust - Check the box to select an employee who you will be making adjustments to; uncheck the box if you will not be making adjustments to that employee. Employee - This column lists all employees in the pay frequency selected above. Salary - If an employee is a salaried employee, this box will be checked. Straight Hours - Enter all hours worked at the straight time rate for the year to date. OV - If the straight time hours for the year to date needs to be overridden, check this box and enter the corrected time in the previous column; the field that was adjusted will display a red background. Over Time Hours - Enter all hours worked at the over time rate for the year to date. OV - If the over time hours for the year to date needs to be overridden, check this box and enter the corrected time in the previous column; the field that was adjusted will display a red background. Double Time Hours - Enter all hours worked at the double time rate for the year to date. OV - If the double time hours for the year to date needs to be overridden, check this box and enter the corrected time in the previous column; the field that was adjusted will display a red background. Shift Diff Hours - Enter all hours worked at the shift differential rate for the year to date. OV - If the shift differential hours for the year to date needs to be overridden, check this box and enter the corrected time in the previous column; the field that was adjusted will display a red background. Total Time - Total number of hours worked will appear in this column. Vacation Time Balance - Enter the amount of vacation time available to this employee (in hours) in this column. OV - If the vacation time balance needs to be overridden, check this box and enter the correct time balance in the previous column; the field that was adjusted will display a red background. Sick Time Balance - Enter the amount of sick time available to this employee (in hours) in this column. OV - If the sick time balance needs to be overridden, check this box and enter the correct time balance in the previous column; the field that was adjusted will display a red background. Straight Wages - Enter the amount of straight time wages for the year to date in this column. OV - If the straight time wage amount needs to be overridden, check this box and enter the correct wage amount in the previous column; the field that was adjusted will display a red background. Over Time Wages - Enter the amount of over time wages for the year to date in this column. OV - If the over time wage amount needs to be overridden, check this box and enter the correct wage amount in the previous column; the field that was adjusted will display a red background. Double Time Wages - Enter the amount of double time wages for the year to date in this column. OV - If the double time wage amount needs to be overridden, check this box and enter the correct wage amount in the previous column; the field that was adjusted will display a red background. Shift Diff Wages - Enter the amount of shift differential wages for the year to date in this column. OV - If the shift differential wage amount needs to be overridden, check this box and enter the correct wage amount in the previous column; the field that was adjusted will display a red background. Base Wages - Enter the total amount of base wages for the year to date in this column. OV - If the base wage amount needs to be overridden, check this box and enter the correct wage amount in the previous column; the field that was adjusted will display a red background. Commission - Enter the total amount of commissions paid for the year to date in this column. OV - If the commission amount needs to be overridden, check this box and enter the correct commission amount in the previous column; the field that was adjusted will display a red background. Bonus - Enter the total amount of bonuses paid for the year to date in this column. OV - If the bonus amount needs to be overridden, check this box and enter the correct bonus amount in the previous column; the field that was adjusted will display a red background. Employee Car Allowance - Enter the total amount of the car allowance paid for the year to date in this column. OV - If the employee car allowance amount needs to be overridden, check this box and enter the correct car allowance amount in the previous column; the field that was adjusted will display a red background. Employee 401-K - Enter the total amount that the employee has contributed to the 401-K for the year to date in this column. OV - If the 401-K amount needs to be overridden, check this box and enter the correct 401-K amount in the previous column; the field that was adjusted will display a red background. Note: The Employee Car Allowance and Employee 401-K are examples of deductions that may be offered. Each type of deduction or benefit you have setup will also have an override column associated with it. Employee Federal Income Tax - Enter the total amount of federal income tax deducted from the employee's pay for the year to date in this column. OV - If the federal income tax amount needs to be overridden, check this box and enter the correct federal income tax amount in the previous column; the field that was adjusted will display a red background. Employee FICA - Enter the total amount of FICA taxes deducted from the employee's pay for the year to date in this column. OV - If the FICA amount needs to be overridden, check this box and enter the correct FICA contribution amount in the previous column; the field that was adjusted will display a red background. Employee Local Income Tax - Enter the total amount of local income tax deducted from the employee's pay for the year to date in this column. OV - If the local income tax amount needs to be overridden, check this box and enter the correct local income tax amount in the previous column; the field that was adjusted will display a red background. Employee Medicare - Enter the total amount of Medicare paid for the employee for the year to date in this column. OV - If the Medicare amount needs to be overridden, check this box and enter the correct Medicare amount in the previous column; the field that was adjusted will display a red background. Employee State Income Tax - Enter the total amount of state income tax deducted from the employee's pay for the year to date in this column. OV - If the state income tax amount needs to be overridden, check this box and enter the correct state income tax amount in the previous column; the field that was adjusted will display a red background. Employer FICA - Enter the total amount of FICA contributed by the employer for the year to date in this column. OV - If the FICA amount needs to be overridden, check this box and enter the correct FICA amount in the previous column; the field that was adjusted will display a red background. Employer Medicare - Enter the total amount of Medicare paid by the employer for the year to date in this column. Employer SUTA - Enter the total amount of SUTA taxes paid by the employer for the year to date in this column. OV - If the SUTA amount needs to be overridden, check this box and enter the correct SUTA amount in the previous column; the field that was adjusted will display a red background. Employer FUTA - Enter the total amount of FUTA taxes paid by the employer for the year to date in this column. OV - If the FUTA amount needs to be overridden, check this box and enter the correct FUTA amount in the previous column; the field that was adjusted will display a red background. Advance Repayment - Enter the total amount of advance repayment made by the employee for the year to date in this column. OV - If the advance repayment amount needs to be overridden, check this box and enter the correct advance repayment amount in the previous column; the field that was adjusted will display a red background. Advance - Enter the total amount of any advances given to the employee for the year to date in this column. OV - If the advance amount needs to be overridden, check this box and enter the correct advance repayment amount in the previous column; the field that was adjusted will display a red background. Net Pay - Enter the net pay for the employee for the year to date in this column.